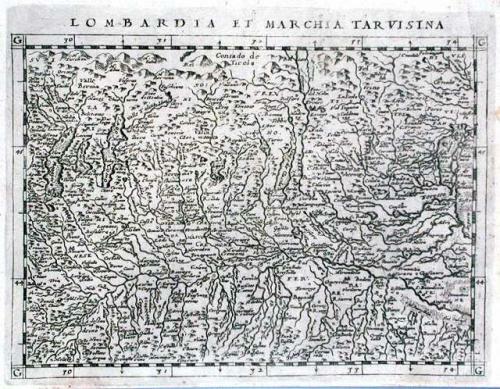 Title: Lombardia et Marchia Tarvisina. Publication: Geographiae universae tum veteris, tum novae absolutissimum opus... Auctore eodem Io. Anto. Magino Patavino..., Cologne 1597, Petrus Keschedt. An extremely detailed map of the Italian province of Lombardy. Text on verso. The map comes from a scarce pirate edition published by Petrus Keschedt in Cologne one year after the publication of Magini's original work. Ortelius informed Magini in November 1597 about this and the publication was stopped till 1608 when a new edition was issued by Keschedt. Although the map is based on Magini's 1596 Geographiae it is in fact a new plate. The Magini's 1596 edition of Geographiae was the first reduced size version of Mercator's atlas. This is the second.